When I got a packet of “Gits” instant Bombay Halwa Mix, I thought it is a combination of maida and other ingredients. However, when I read the ingredients, I understand it is made from China Grass (Agar Agar). Agar Agar (China Grass) is a pure vegetarian food product extracted from different types of seaweed or sea red algae. It acts as a perfect “Slimming Diet” and cools the body. Usually Halwa is little chewy with lot of ghee in it. Since this recipe does not need any ghee, I thought naming it “Halwa” as mentioned in the Instant Mix packet, will not properly describe this recipe. So, I call it “Pudding”. 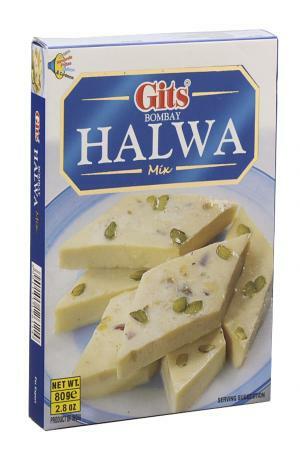 Put the Gits Bombay Halwa Mix in a thick bottomed vessel and add 2 cups of lukewarm milk and mix well. Keep it on a medium flame and stir continuously till it boils well. 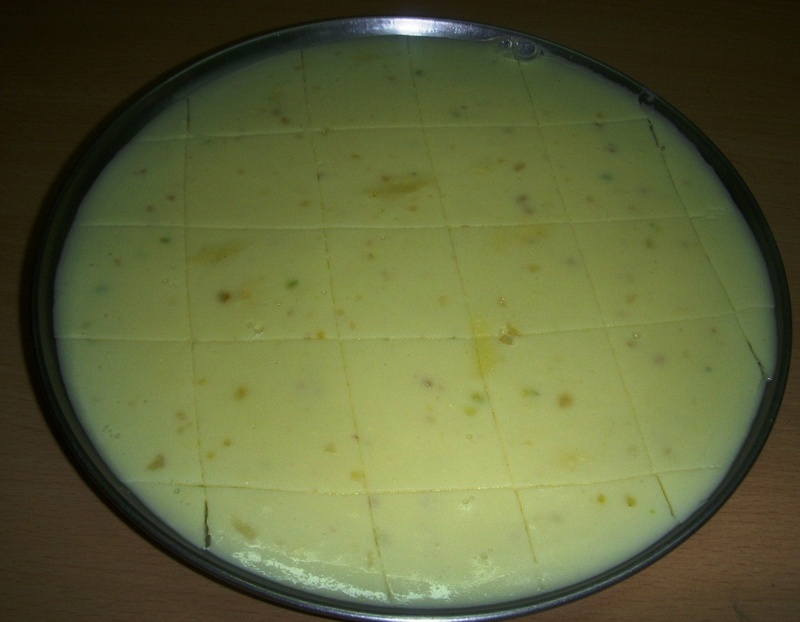 If you allow to boil for five to seven minutes, it looks like a thick kheer. Pour it on a tray or plate. Allow to set for 30 to 45 minutes. Then using a sharp knife cut it into desired size pieces. You will get approximately 20 pieces. Note: You can pour the mixture into small bowls and when set, turn it down and remove the pudding. In Chennai and US, Gits products are available in most of the Grocery stores. But in Bangalore, I am not sure where you will get it. You can try in big stores. Who asked you about Chennai? She is asking about Bangalore. You can find it in More Megastores across Bangalore. I’ve also seen it other supermarkets such as D-Mart. Thank you for the information. Hope it will help her to get it in Bangalore. 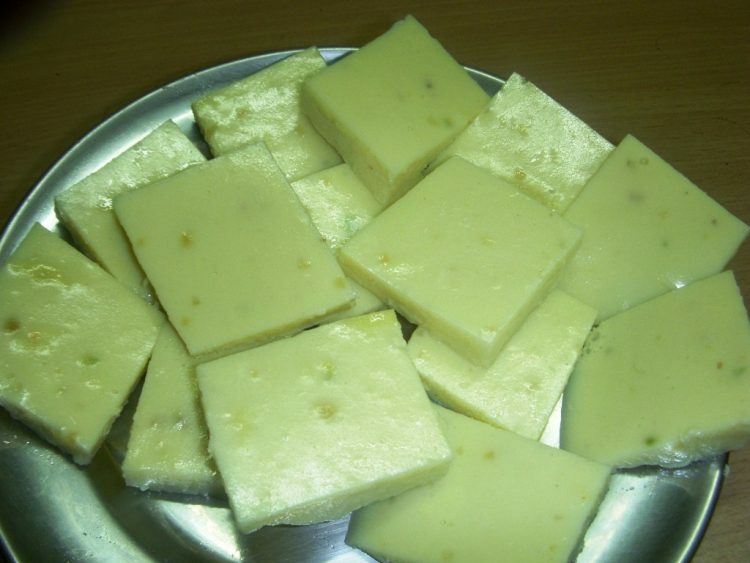 kamala intha halwa taste eppadi irukkum..imean does it taste like chewy or normal bakery shop halwa..pl reply i like to do this for my get together.. It does not taste like chewy halwa. This is purely a china grass (agar agar) recipe and taste like a pudding/smoothie.